A disturbing and dangerous ideological turn has overtaken a large portion of the American conservative movement during the past several decades and—more precipitously—during the past few years. This combination of anti-intellectualism, religious zealotry and intolerance, the desire to micro-regulate the personal lives of millions of Americans, and the abandonment of the ideas of individual liberty, limited government, and free markets can best be called pop-conservatism—characterized as it is by a populist appeal to the masses rather than a sophisticated appeal to the intelligent layman. Some, though by no means all, of pop-conservatism’s representatives occupy leadership roles in media, politics, and religion. Television commentators such as Bill O’Reilly and Sean Hannity, editorial writers like Ann Coulter, political candidates like Sarah Palin, religious figures like Jerry Falwell and Pat Robertson, and even former Presidents such as George H. W. Bush and George W. Bush can be characterized as pop-conservatives. Pop-conservatism currently dominates the platforms and methods of the majority of Republican Party candidates and officials; indeed, it can safely be said that the Republican Party has become, perhaps irremediably, the party of pop-conservatism. Here, the major elements of pop-conservatism and their dangers shall be identified, and remedies to this movement shall be proposed. If individual liberty is to be preserved against a massive growth of regulations and restrictions, it is imperative that the name of freedom does not become tainted by association with an agenda that is antithetical to it. Pop-conservatism represents a distinct departure from earlier more sophisticated strains of conservative thought represented by thinkers such as Russell Kirk, Richard Weaver, Allan Bloom, C. S. Lewis, and William F. Buckley, Jr. Moreover, pop-conservatism is practically antithetical to the ideas of such intellectual free-market thinkers as Ludwig von Mises, Friedrich Hayek, Murray Rothbard, Ayn Rand, Milton Friedman, and Ron Paul. Neither the former set of more “traditional” conservatives—whom we shall call the serious conservatives—nor the latter set of advocates of free markets and individual liberty—whom, despite the somewhat simplistic terminology that this would require, we shall call the serious libertarians—would at all welcome the pop-conservative emergence. Whatever their differences, earlier strains of serious 20th-century conservatism and libertarianism were alike in a desire to elevate the positive and normative understanding of the world exhibited by the general public. Major arms of serious conservative and libertarian movements have been profoundly intellectual in their efforts to inform the general public’s understanding of history, culture, economics, philosophy, and political theory. 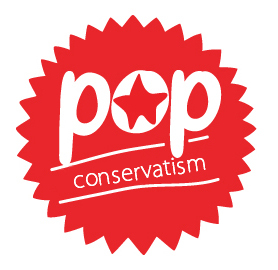 Pop-conservatism does the exact opposite of uplifting the general public. Rather, it intellectually descends to the level of the lowest common denominator in order to garner votes, attendance at rallies, large audiences for radio and televisions shows, and readership from an insufficiently educated and sophisticated demographic. The verbal encapsulation of this approach can be found in Sarah Palin’s September 30, 2008, statement that “It’s time that normal Joe six-pack American is finally represented in the position of vice presidency…” In effect, Palin was proudly claiming to be no better than her constituents—as a result of which it would make no sense for her constituents to delegate to her any manner of political power, since they could have personally accomplished the objectives for which such power would be delegated just as well as or better than Sarah Palin could. The very designation of “Joe Six-Pack” is not only profoundly insulting, but it perpetuates pride in a self-destructive, mindless cultural image that has done damage to large segments of the American population. A Joe Six-Pack is by definition a person of no distinction—no great accomplishments, no noble aspirations, no extraordinary abilities or virtues. He is just “the average Joe.” What human being with a shred of dignity would wish to be called this? Moreover, a Joe Six-Pack is intemperate in his alcohol consumption, indolent, not particularly eloquent, and often anti-intellectual himself; he holds a snide contempt for people of learning—the “sophisticates” of this world; he holds prejudices against cosmopolitan culture and toleration and against the exhibition of universal decency toward all human beings irrespective of their race, religion, or ethnicity. A Joe Six-Pack is a localist by mentality, who is almost obsessively fearful of the unusual, the foreign, the “folks who ain’t from around here.” In some incarnations, a Joe Six-Pack also exhibits a frightening degree of machismo—a relishing of violence, of “blood, sweat, and tears” sacrifice, and a contempt for all intellectual matters and white-collar “paper-pushing” work as the occupation of effeminate “pansies.” Never mind that the “pansies” by this definition have included all the great philosophers, scientists, inventors, and entrepreneurs of history—the creators of all human civilization! To demolish the Joe Six-Pack stereotype as dangerous and destructive is not to insult lower-income Americans. Rather, it is to suggest that virtually all lower-income Americans can do better than to follow the Joe Six-Pack role model, and indeed many of them have done better. The tragedy of pop-conservatism is that it greatly underrates the intellectual capacities of its audience, which, with a modicum of guidance and instruction, can understand advanced political and economic concepts that are crucial to the functioning of a free society. Many of the speeches of Grover Cleveland, Calvin Coolidge, and even Ronald Reagan show that it is possible to popularize sophisticated ideas without diluting them or diminishing those ideas’ influence. Unfortunately, the pop-conservatives’ approach has entirely jettisoned the more refined arguments propagated by these statesmen of the past. Among the consequences of the pop-conservatives’ anti-intellectualism is the virtual abandonment of ideas which, in the not too distant past, were at least affiliated with the “conservative movement” in the United States. These ideas include the maximal liberty of the individual from government interference, the limitation of government size, and the desirability of free, unhampered markets in goods and ideas. One of the primary reasons for these ideas’ abandonment is that they require a well-developed intellectual groundwork to understand and appreciate. The entire case for liberty is non-particularist; it does not depend on any given set of individual preferences or goals, and by itself it does not guarantee the fulfillment of any individual preference or goal. Rather, liberty sets in motion systemic tendencies that facilitate improved non-coercive preference fulfillment for virtually everyone, while minimizing harmful interference with every individual’s attempts at flourishing. One of the characteristics of a non-intellectual or anti-intellectual mindset is the inability to conceive of any regularities beyond immediately perceptible events and stereotypical “common wisdom” and any means beyond the most direct for the attainment of one’s goals. The pop-conservatives and their constituents have exhibited this deficiency in their abandonment of support for liberty and their replacement of it with particularist agendas to enshrine their own moral values by a combination of legislative fiat and private coercive actions. Even when the rhetoric of liberty and free markets is not dropped by the pop-conservatives, the substance and the understanding of these ideas is. The best illustration of this tendency at work can be found in the George W. Bush administration (2001-2009), which has enacted unprecedented growth in both federal spending and federal power—even when foreign policy is excluded from consideration—despite its nominally “free-market” platform. The Bush administration was quintessentially pop-conservative in its lack of hesitation in spending vast amounts of government money to directly achieve particularist goals—evidenced by anything from massive government contributions to “faith-based organizations” to Bush’s support of a then unprecedented economic bailout. No person who truly understands the principles of the free market would believe that the survival of particular firms or business models is necessary to “save” an economy or keep it prosperous; rather, a free-market advocate would trust the spontaneous order of billions of human interactions to generate an outcome that is much more consistent with the flourishing of every individual than a centrally coordinated plan could ever be. Although they sometimes employ free-market rhetoric, pop-conservatives are only fair-weather friends of liberty. They will unhesitatingly enact colossal infringements on freedom when they consider their particular preferences to be threatened by the free association of individuals. Moreover, when they personally assume power, the pop-conservatives do not act as limited-government proponents. Rather, they most often consider themselves to have the prerogative to do whatever is not explicitly forbidden—and even some of that which is forbidden. Consider, for instance, George W. Bush’s notorious use of presidential signing statements, through which he blatantly announced that he would interpret laws contrary to their letter and to the intention of their authors—and even at times declared that he would not enforce certain parts of bills he himself signed. Or consider Sarah Palin’s infamous remark as mayor of Wasilla, Alaska, to a city council member upon spending $50,000 of city funds to redecorate her own office: “I’m the mayor, I can do whatever I want until the courts tell me I can’t.” Pop-conservatives do not believe that the limitations on government power should apply to themselves when they hold office; quite frequently, pop-conservatives merely use the rhetoric of limited government to gain support from a constituency that is somewhat sympathetic to such ideas. Once elected, however, the same people do not hesitate to outspend and out-regulate the more intellectually honest open advocates of government growth on the left. "A favorite tactic of the pop-conservatives is to claim that they support the free market 'in general' and are even 'disappointed' in 'having' to advocate government intervention in the present situation, but this time the free market and individual liberty alone cannot save the situation." A favorite tactic of the pop-conservatives is to claim that they support the free market “in general” and are even “disappointed” in “having” to advocate government intervention in the present situation, but this time the free market and individual liberty alone cannot save the situation. Of course, this pseudo-pragmatism is exhibited not just every now and then, but constantly, because the present is always “this time” at which free-market principles allegedly need to be abandoned. When examining the policy records of such pop-conservatives as McCain, both Bushes, and Palin, one rarely sees a time when specious considerations of expediency did not trump freedom. A hallmark of pop-conservatism is an increasing attempt to introduce a militant religiosity into public discourse and government policy, as well as a rabid intolerance for large groups of people who do not share the highly particular religious sentiments of the pop-conservatives—including atheists, gays and lesbians, immigrants, civil and political libertarians, most intellectuals, academicians, scientists, and secular philosophers, the always conveniently unspecified “liberals,” and even those “softly” religious Americans who prefer to maintain modest, private, and somewhat flexible forms of worship. The increased prevalence of vitriol and ad hominem attacks in pop-conservative circles can be explained by pop-conservatism’s shift from the earlier conservatism’s universal principles to identity politics—precisely the approach that many pop-conservatives accuse the Left of pursuing. Pop-conservatism cultivates an “us-versus-them” view of political issues—consistent with a polylogist, class-warfare-based perspective of the world. By contrast, earlier conservatives and libertarians advocated a “pursuit of truth” view of political discourse—where, through intelligent, civil discussion and argumentation, it is possible to get all people to agree on what the best courses of action are. In the pop-conservatives’ judgment, the “good guys” are the “Joe Six-Pack” Caucasian American-born heterosexual Christians who exhibit certain attitudes toward life, participate in certain economic arrangements, and maintain a “tough” and “manly” spirit which is often mistakenly thought to embody American or even Western civilization—and everyone else is the “enemy,” incapable of being persuaded by argument and only worthy of being dealt with via mockery, intimidation, and political repression. The invective-based approach of pop-conservatives is, of course, incompatible with individual liberty. How can anyone even appear to honestly support free speech while cutting off opponents in discourse, heckling speakers, and comparing—as Bill O’Reilly did—Rosie O’Donnell’s expression of her views as a private individual to Joseph Goebbels’s state-funded propaganda in Nazi Germany? It is my strong suspicion that pop-conservatives, were they to find themselves in a state of greater political power, would begin to openly crack down on the freedoms guaranteed by the First Amendment and would censor the media, publications, the Internet, and personal freedom of association. One needs only to read the rulebook of the private totalitarian tyranny pop-conservatives have established over some 600 full adults at Clearwater Christian College (CCC) to see what the same people might do if they came anywhere near governmental power. Indeed, the CCC already receives federal aid, which indicates that the pop-conservatives have influenced the government to use taxpayer dollars to fund religious tyranny. Before pop-conservatism fatally undermines any attempts to preserve individual freedom in the United States, it is necessary to thoroughly reject this ideology on a personal level and to adopt operational practices contrary to pop-conservatism when promoting ideas and making policy recommendations in the public sphere. First, it is essential to drop the attempt to gain supporters for freedom by abandoning those principles of freedom that are deemed too complicated for “Joe Six-Packs” to understand. The victory of freedom does not require Joe Six-Packs—but it does require the genuine understanding of the principles and values of liberty by every intelligent, thinking person of every social, cultural, and ethnic background. The localism, particularism, and identity politics of pop-conservatism must be rejected in favor of a cosmopolitan approach that emphasizes universally valid economic, political, and moral truths. True champions of freedom must be tolerant of all individuals who do not initiate force against others; instead of labeling people as “the enemy” or “the other,” friends of liberty must reach out to those who have not been exposed to the principles of freedom or disagree with those principles—and attempt to persuade such individuals through genuine argumentation and without any displays of personal contempt or prejudice. Moreover, these truths must be argued for using only reason and evidence—not appeals to faith, fiat authority, or group affiliation. In particular, the religious arguments for liberty—while they may be effective in showing particular religious groups that freedom is consistent with their faith—should not be claimed to be the only valid or proper arguments. This alienates an enormous constituency of atheists, agnostics, and “softly” religious persons who—by the fundamental contents of their worldviews—would necessarily reject the religious arguments. Pop-conservatives have done liberty a great disservice by spending much of their time attacking secular arguments for freedom instead of genuinely trying to liberalize political institutions. Most importantly, adherence to principle must always trump perceived considerations of expediency—however skillfully couched in rhetorical or populist appeal those might be. A principled approach is not an approach that is devoid of incrementalism—but it must always insist on movement in the right direction. While a principled friend of liberty might be willing to settle for a slight reduction in government power now in hopes of achieving a greater reduction in the future, he would never advocate an increase in government powers which are antithetical to individual freedom. The pop-conservatives have been notorious for promising only to increase government power a little less than those on the Left—and have often in practice increased it by a much a greater extent. The pop-conservative attitude that “this time is different” and free-market principles somehow magically do not hold ought to be rejected. The task of defeating pop-conservatism falls on serious libertarians and serious conservatives alike. If, through the defeat of pop-conservatism, it becomes possible to establish strong internal solidarity in favor of liberty among its self-proclaimed friends, then the external threats to liberty will be much easier to confront.